The Louisiana Department of Wildlife and Fisheries (LDWF) will renew it's celebration of National Hunting and Fishing Day on Saturday, September 28, 2013. NHFD is a national event on the fourth Saturday in September. It was created in 1972 when Congress passed two bills establishing a specific day to celebrate the conservation contributions of our nation’s hunters and anglers. LDWF introduced its first NHFD event in 1982 at the Monroe district office. In the following years, three more locations were added in Baton Rouge, Minden and Woodworth. Today, more than 10,000 people statewide attend the celebrations. This free event offers activities for the entire family such as archery, fishing, fly casting, fly tying, shooting, canoeing, biking and much more. Visitors can learn about coastal restoration, bird watching, turkey hunting, game tagging, and much more from various organizations, agencies, and sponsors. The Cenla NHFD Outdoors Festival held at the LDWF Woodworth Education Center is the largest in the state with about 2,000 attendees. This event begins with fishing at 7:00am, opening ceremonies at 9:15am, and continues on until 2:00pm. There are dozens of activities and demonstrations throughout the day. There's even free food and refreshments as well, courtesy of Burger King, Sayes Office Supply and Alexandria Optimist Club. New this year is the inaugural Woodmen of the World Team Barbecue Cookoff Contest. 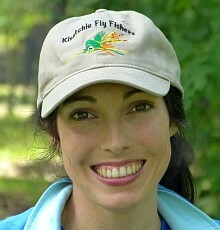 For 2013, the Woodworth event will feature fly fishing courtesy of the Cane Country Fly Casters and Kisatchie Fly Fishers. There will be casting, fly tying, knot tying. Kids and adults will get the opportunity to hands-on lesson in casting, tying, or knots. If you are interested in anything related to fly fishing, or even the sport of kayak fishing, be sure to look for our booth at the Woodworth NHFD Festival.